Comefri SpA is a global manufacturer of high efficiency backward curve belt drive blowers. 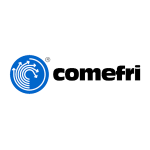 Based in Italy, with facilities in North America, Europe and Asia, Comefri products are renowned for their excellence in engineering and performance. Markair Components stocks a range of Comefri fans that are suitable for many applications, from sizes 400mm to 1200mm impellors. Please contact us if you have an application requiring high efficiency components or an existing Comefri blower that requires replacement or refurbishment.